Honeybees are not native to the US. Although there are some escaped colonies living on their own, the vast majority is managed by beekeepers. It is best to think of them like livestock, except that they have the unusual function of pollinating crop plants. Like other livestock, their numbers have changed over time due to market forces. In the US, the numbers of honeybee colonies declined from 5.9 million in 1947 to 2.3 million in 2008, and more recently they fluctuate between 2.5 and 3.2 million. This long-term decline in honeybee colonies in the US has historically been closely related to low honey prices, but now in the US, payment for pollination services, rather than honey, is the major source of income for beekeepers. For keepers of migratory bees, the big market is in pollination of almonds in California. About 1.8 million hives are moved into over 1 million acres of almonds in late February for the bloom, renting for $180 – $200 each. Do the math. That’s about 2/3 of the hives in the country, traveling to California almonds from all over the US, being rented for a few weeks for about $342 million. Then these beekeepers spread out, with some coming all the way to New England to pollinate wild blueberries in Maine at a fee of $85 – $120 per hive for 3-4 weeks. 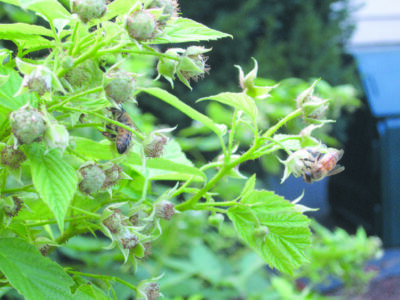 Honey bee on raspberry flowers. The potential for spread of parasites and disease causing pathogens is obvious, and honeybees are subject to a number of devastating parasites and pathogens. The greatest immediate threat to honeybees is from a species of mite, called the Varroa mite, which arrived in the US in the late 1980s. These mites not only cause direct harm to honey bees, but more importantly they have greatly increased the damage done by viruses to honey bees, creating a new mode of transmission by directly injecting viruses into the circulatory system of the bees. Honeybee researchers have identified between 16 and 24 different viruses in honeybees (depending on how they define “different” viruses). Among the most common is Deformed Wing Virus, which acts synergistically with Varroa mites – the virus makes honeybees more susceptible to the mites, which increases the harm done by the virus. The most recent national honeybee survey shows that most beekeepers have low levels of Varroa mites through the spring and early summer, well below the economic threshold of 3 mites per 100 bees, but then the numbers of mites increase rapidly in late summer and fall. 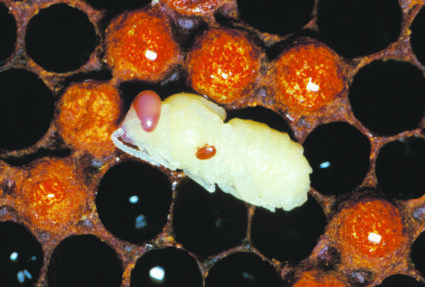 Based on a national survey, beekeepers who monitor and manage their Varroa mites using any of a variety of products formulated for that purpose, including some based on essential oils or organic acids, are less likely to lose their hives than those who do not use any formulated product, including those who use techniques like removal of drone comb, dusting with powdered sugar, or treating with unformulated natural materials like herbal extracts. Beekeepers who allow mites to build up risk not only their own hives, but also those of neighboring beekeepers, as mites hitch rides on workers raiding out failing colonies or drifting between colonies. It could be worse. National surveys periodically scan bees across the country looking for another mite, Tropilaelaps, which is widespread and damaging to honey bees in Asia. This mite reproduces and develops more rapidly that the Varroa mites we already have and kills the honeybee brood (developing larvae) directly in addition to making adult bees smaller and weaker. Beyond these direct threats to honey bees is a second tier of continuing stresses that also make life difficult for honey bees and beekeepers, including pesticides and lack of quality foraging habitat that also affect a range of other bees. Broad spectrum insecticides, those that kill a wide range of insect pests, are generally toxic to bees also. This includes some insecticides used by organic growers. In the most comprehensive extension publication on the subject, “How to Reduce Bee Poisoning from Pesticides,” now available as an app, spinosad (the active ingredient in Entrust) is rated as moderately toxic to honey bees, and pyrethrin (active ingredient in Pyganic) is rated as highly toxic. These ratings are of acute toxicity – the dose that causes 50% of individual honeybee workers to die within a specified time period. This has been the standard method of measuring bee toxicity for decades, but it may not be the best measure of the effect of a pesticide on a honeybee colony. Honeybee colonies have from 10,000 to 40,000 workers, and they can lose a lot of individual workers without affecting the ability of the colony to survive and reproduce. The workers, the bees that forage for nectar and pollen and provide pollination services, don’t reproduce and are expendable. In summary, there are a lot fewer honeybee colonies than there were sixty years ago, but the numbers have been stable in recent years. Beekeepers have to protect their honeybees from several threats: Varroa mites, viruses, other diseases, and pesticides, but they continue to keep bees – the larger beekeepers do it to make money from pollination, and the smaller beekeepers do it for lots of reasons – for honey, for local pollination, and because honey bees are fascinating to watch. What about other bees? Bumblebees are the most clearly threatened group of bees — here in the Northeast, across the country, and around the world. You may have heard that one species of bumblebee, the rusty patched bumble bee, has been declared a Federal endangered species. This bee was common in the Northeast before the late 1990s, but has not been found here in over 10 years. This is only one of a group of bumblebee species that suffered a rapid decline in range and abundance in the same period. 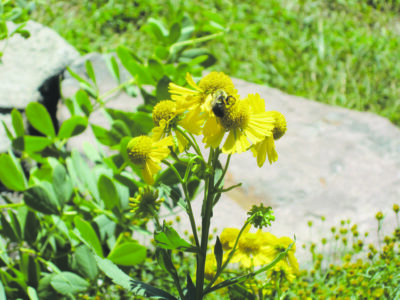 A number of scientists have suggested that this rapid decline was a result of the commercialization of bumblebees. In the late 1990s several European companies began selling bumble bees to greenhouse growers to pollinate tomatoes, peppers, and other greenhouse crops, bringing North American species over to Europe to develop methods of mass production, and then bringing the mass reared bees back to North America. The exact sequence of events is not entirely clear, but it appears that there is a connection between the increase in a European strain of a fungus attacking bumblebees and the crash of several sensitive bumble bees species in the same time period. Another stress is from pesticides. Bumblebees and solitary bees are probably more sensitive to the effects of pesticides than honeybees. Bumblebees are social, like honey bees, but for only part of the year. In the middle of the summer, bumblebees live in social colonies – although with up to a few hundred bees in a colony, rather than thousands. So at that time of year the colony could possibly afford to lose some foragers to pesticides without affecting colony survival or reproduction. But at the end of the season – late summer to fall, depending on the species – the colony produces males and new queens, which mate with each other. Then the new queens forage for themselves, find protected places to pass the winter, emerge in the spring, hunt for a site to build a new nest, and then forage again for nectar and pollen to feed themselves and their developing larvae. During all that time the bumblebee queens are highly vulnerable to pesticides, as well as to many other hazards and stresses. There are hundreds of other species of bees, in addition to honeybees and bumblebees, many of which are important pollinators. Dozens of species of spring ground nesting bees are important pollinators of apples, blueberries and other spring fruit trees, and other more generalist social sweat bees, along with honey bees and bumble bees, are pollinators of vegetable crops like tomatoes, peppers, cucumbers, melons, and pumpkins. We know very little about whether the abundance and diversity of these bees are stable, declining, or even increasing, but we know about what these bees need to thrive: safe places to nest (for many of them, in the ground), abundant sources of pollen and nectar, and protection from pesticides.